This Friday, I have got a very nice e-mail from one my long-time reader. I'm not going to publish the e-mail but the reader has mentioned that he was shocked and panicked when he realized that blog.iGICS.com does not exist. Fortunately, this particular reader found the new address of my blog which is www.VCDX200.com. The e-mail forced me to stop for a moment and think about my blogging history. I have started blogging back in June 2006 on the address http://davidpasek.blogspot.com. May 2006: I have been reading for a long time in various magazines and websites that write blogs is in and trendy. It is said to write blogs! It is quite easy to start, but to write something on a regular basis, and even to have a head and heel, it will not be that simple. And what do I want to write about at all? It will, as it were, mainly IT, which has been for years, and I could say even a decade of my hobby and passion. So let's see how this blog eventually turns out. Only first four blog posts were written in my native language because I have very soon realized that blog about Information Technologies must be written in the English language to address global IT community. My English language is far from perfect, but it is the only global language, therefore there is no other choice. Over the time I thought that domain igics.com is not easy to remember for my readers and because I moved from DELL to VMware and currently blogging mainly about Vmware topics I have decided to change the internet domain to VCDX200.com as all Vmware enthusiasts hopefully know what VCDX is so it is easier to remember. For some time there was an automated redirect from *.igics.com to www.vcdx200.com but I have recently decided to not pay igics.com domain anymore. However, all content is preserved and available in the new domain. It is fair to say, that I'm blogging mainly for my self to document the knowledge which I would like to preserve and share with my customers who are paying my bills. The public content sharing is just a side effect :-) but it is nice to contribute to some communities so this is what I do here as well. This weekend I stopped for a minute (actually two or three hours) and did some statistics. Over times I published 567 posts but to be honest, first few years I was doing "microblogging" so publishing interesting links to other resources on the internet just to quickly find it when necessary. Sometime in 2013, I have started publishing bigger posts which can be qualified as full articles. 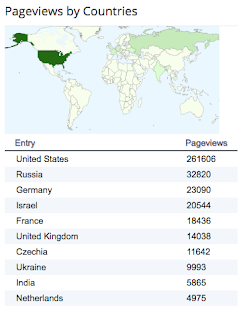 The majority of my readers are from the United States. I personally think that US is the leader in Information Technologies so I'm proud my articles are interesting for US IT community. Almost, 10 times fewer readers are from Russia, Germany, Israel, and France which are top IT technology countries in EMEA region. So Michael (he is the US reader who has sent me the e-mail), thank you again for your nice e-mail and hope not only you but also others will appreciate that the address blog.iGICS.com is back. Paying $10 per year for another internet domain is probably not ruined me :-) so I hope it helps at least a little bit to global IT community.